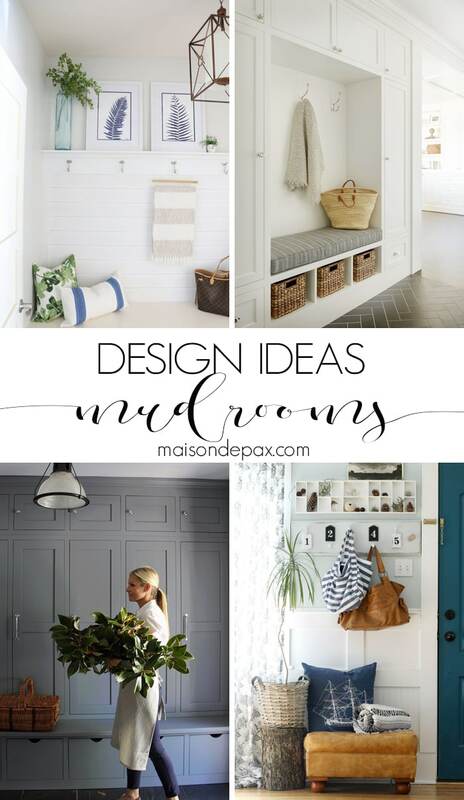 Mudroom ideas for different spaces! Get ideas for how to design a mudroom for small spaces, laundry rooms, hallways, and more. Who wouldn’t love an enormous, designer-decorated, designated mudroom space? The reality for most of us, though, is that our homes simply don’t offer that. Looking at beautiful mudroom spaces can be inspiring, but knowing how to design a mudroom for your own space is not always that easy… Today I’m here to help. 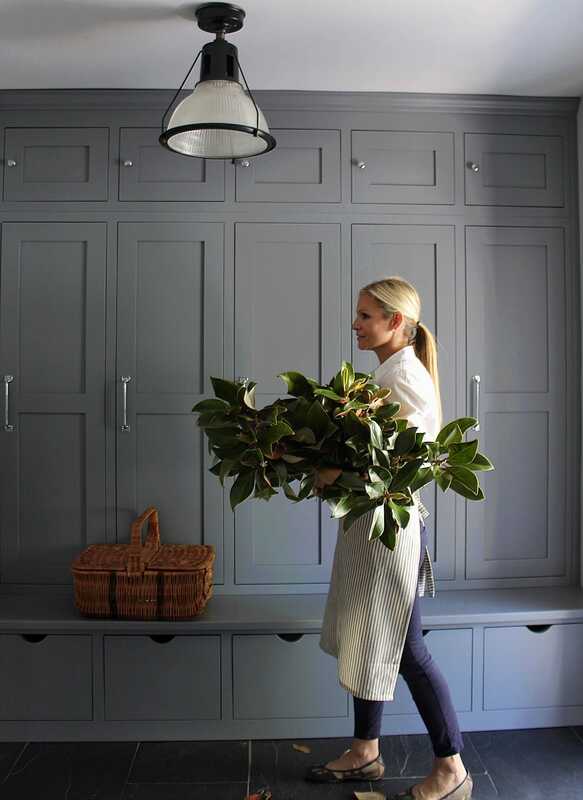 Using some incredible mudroom ideas for design inspiration, I’ve got ten tips for designing a mudroom to suit your home and life. Make your mudroom a focal point. Don’t have a separate entryway large enough for a mudroom space? No problem. 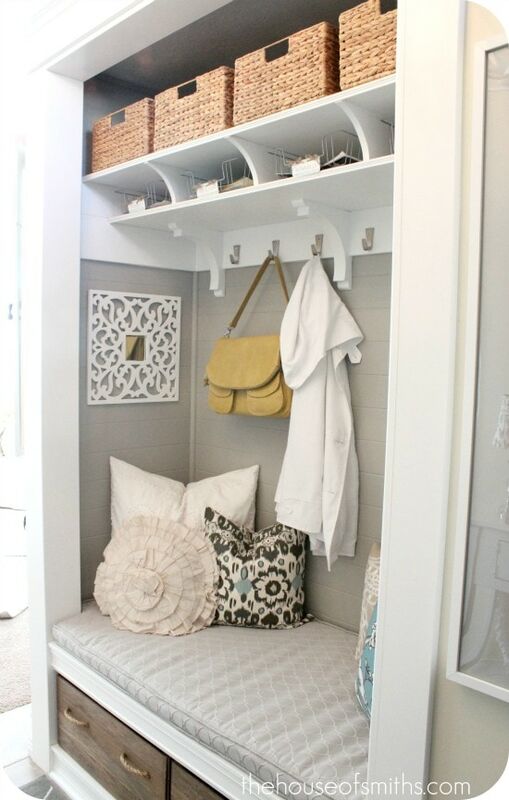 Mudroom spaces like this gorgeous diy mudroom bench are beautiful enough to grace your family room, living room, or even dining room… wherever you have the space. And the bench can be additional seating in the room! Use baskets to hide clutter. 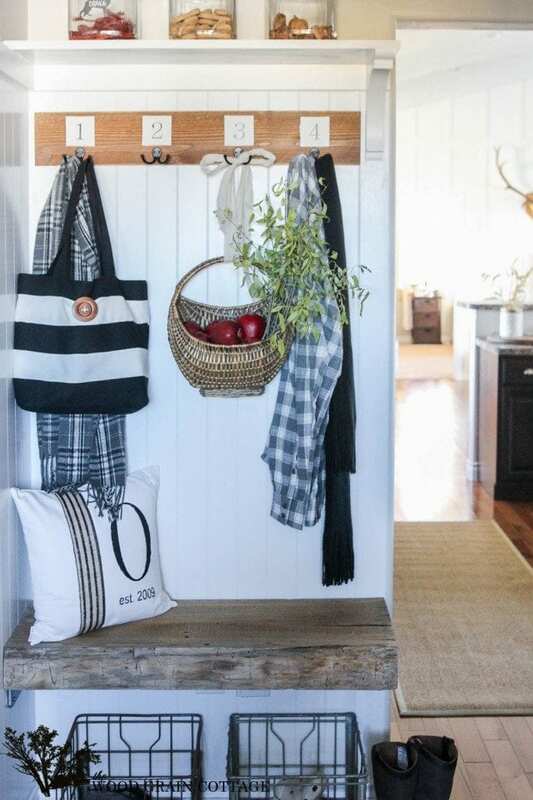 If your mudroom space is in a main living area (or even visible from them), you want to be sure to have baskets to corral the shoes and other random items. 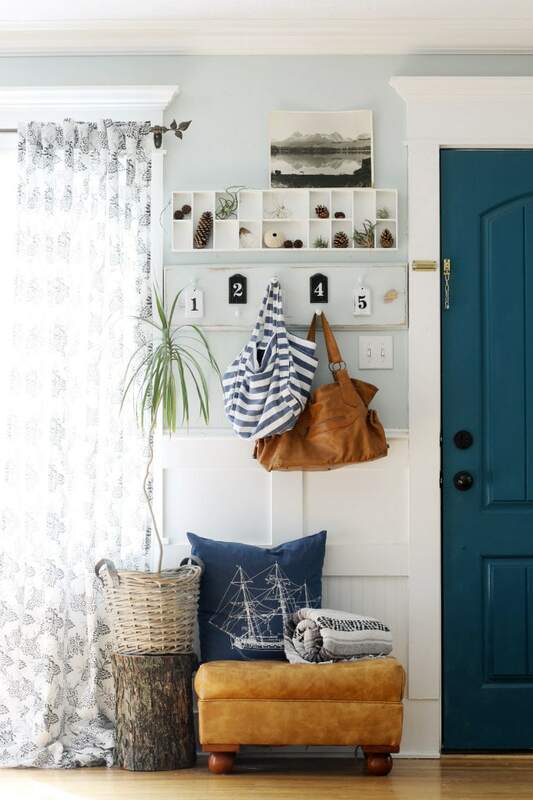 Hang artwork to decorate a mudroom. On that same theme, your mudroom doesn’t have to be tucked away from the rest of the house if it’s beautiful! Add some artwork like Life on Virginia Street did so you can enjoy the space no matter where it is. 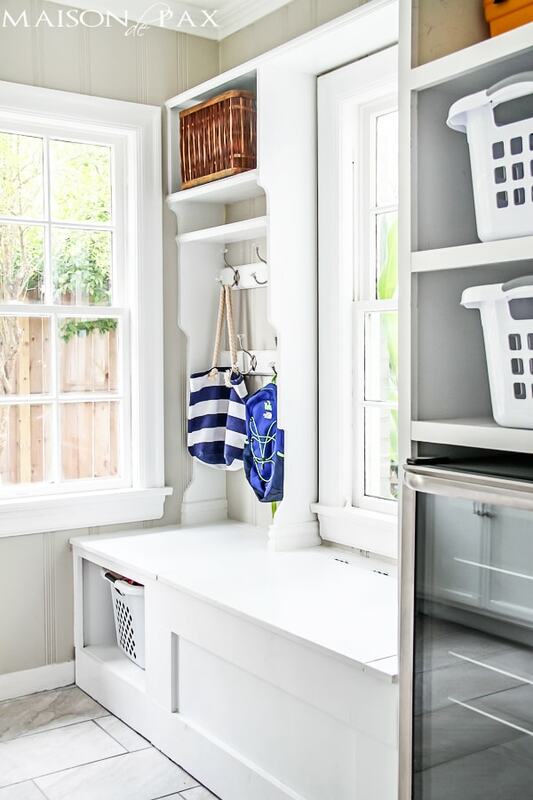 Add a mudroom in your laundry room. It doesn’t have to be huge. A corner of the laundry or utility room can be just as functional for storing bags and shoes. One of the best rules to an organized home is to make sure everything has its place, and the laundry room is a fine place for those things to live! Blend it with your kitchen. Using kitchen cabinetry is not only a logical way to design and build a mudroom space, but it can give your home a seamless feel. 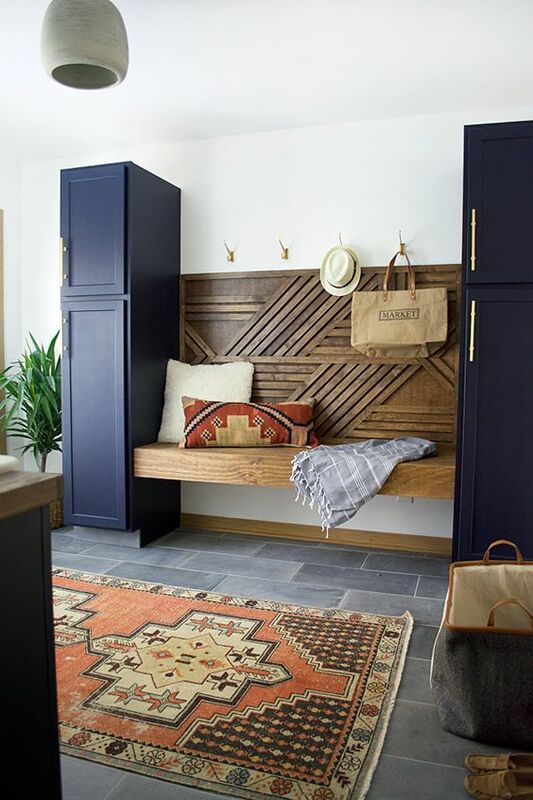 Design a mudroom bench right into a wall of kitchen cabinetry like you see in these gorgeous spaces by Marianne Simon Design and House 214 Design, and use it in the heart of your home! Turn a closet into a mini mudroom. Still lacking a functional spot after all those ideas above? Try a little closet. 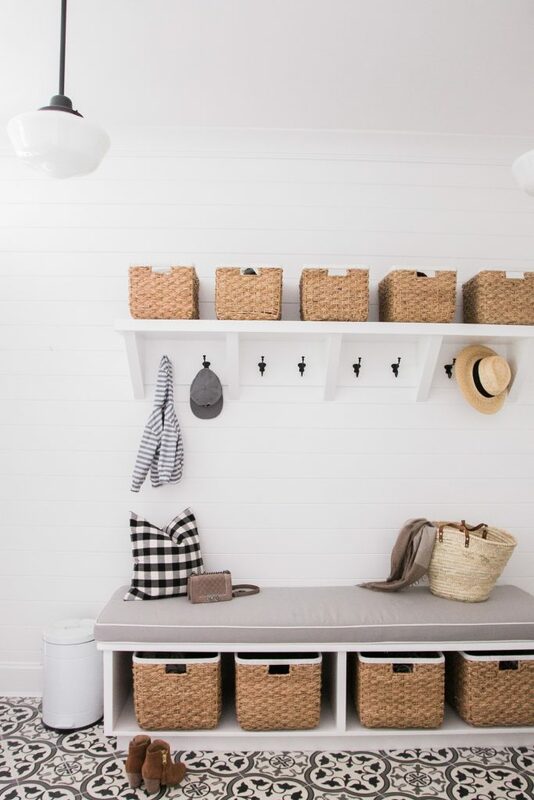 It only takes some hooks and baskets to organize things and any spot can become a mini mudroom. Some of these diy mudrooms could be done by simply taking the doors off a closet and adding a built-in bench… So many possibilities! 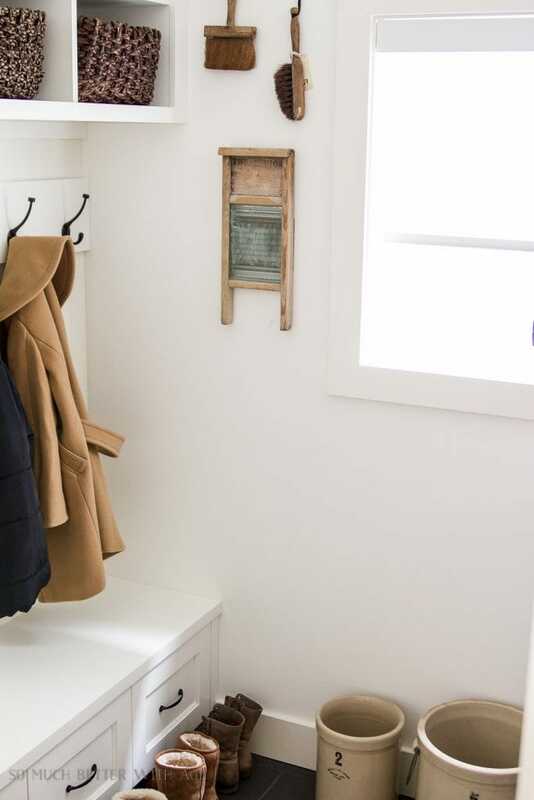 Turn a hallway into a mudroom space. 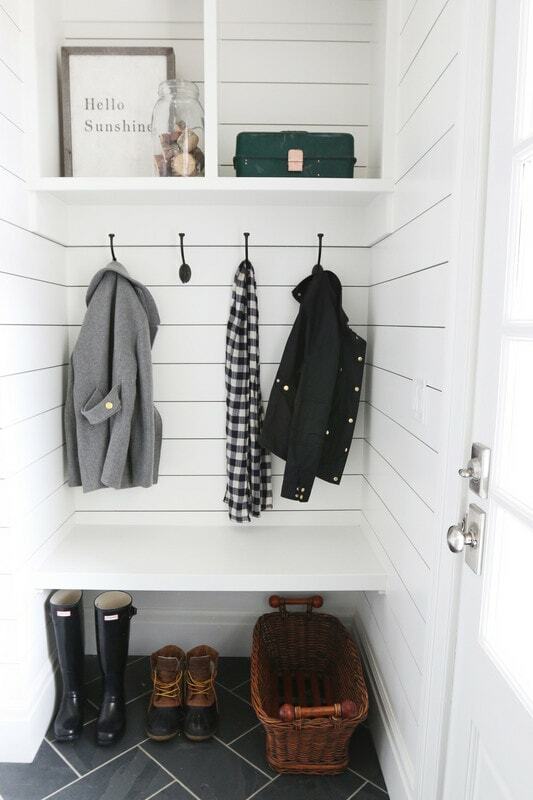 Don’t have a room off your entryway to designate as a mudroom? Try a hallway. 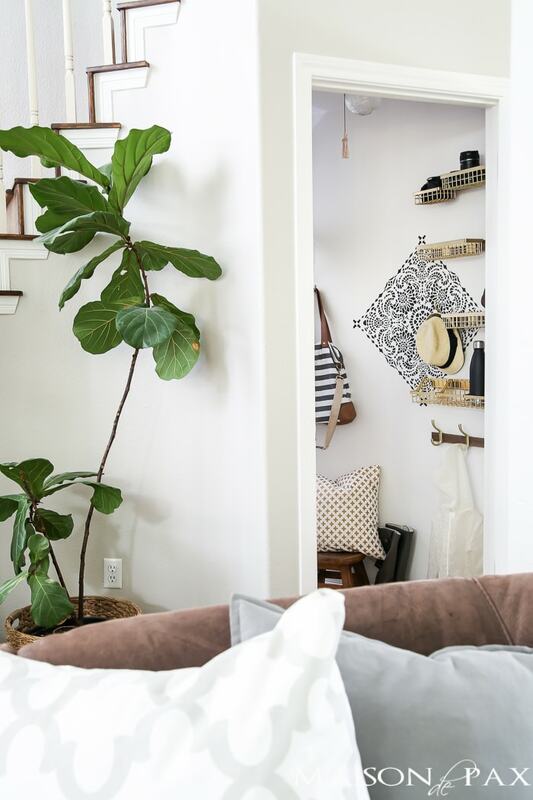 Hallways are often unused spaces, and all it takes is a few cabinets or some a little hall tree with hooks and baskets to transform the space. 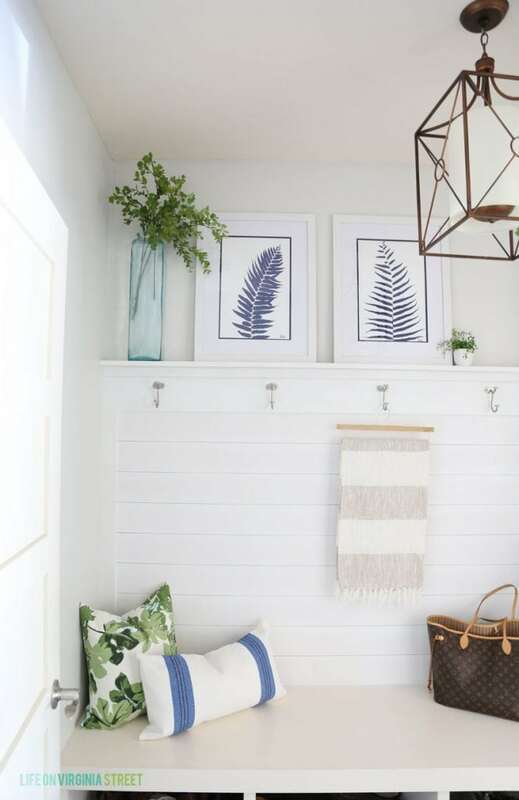 These mudroom ideas for small spaces are brilliant: an ottoman, bench, or shelf below some hooks can turn almost any small space into a mini mudroom! So what kind of space do you have? 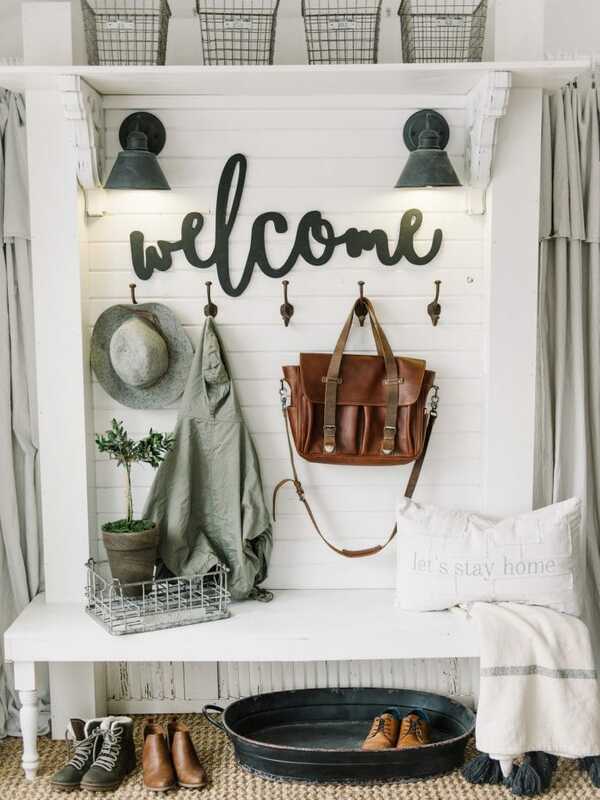 Whether a hallway, a closet, a laundry room, or even part of your living space, try adding a bench, some hooks, a shelf, some cabinets, and/or some baskets and make it a mudroom space to work for you and your family! Great round up of ideas Rachel. These are just what I needed to see! We are building a bench and mudroom area at the front of our house and while we have the bench designed, I was struggling a little with how to finish off the space. Now I have a zillion ideas! Thanks!!! So glad it is helpful, Kristin! Such a great list, Rachel! Thanks for including my mudroom!